- What kind of bird can kill a lion with a single kick? - How can some dogs know that a storm is coming before it appears, or can sense when their masters are about to experience a seizure? - Which creature perlexes scientists because of its amazing ability to heal itself, even when it sustains horrendous injuries? - How do Emperor Penguins go two and a half months without eating or drinking? - How can birds navigate over thousands of miles of ocean and never get lost? - How do fireflies and glowworms create light that generates no heat? - How do great whales dive to the bottom of the ocean without the pressure causing them to implode? - What creature was the inspiration for the helicopter? - How can some creatures be cut in half and still regenerate themselves? Some can even grow a new head! 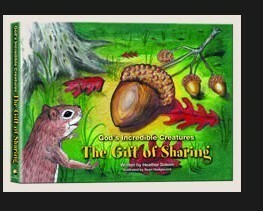 Includes Incredible Creatures That Defy Evolution I, II, III and God's Incredible Creatures - The Gift of Sharing Book. 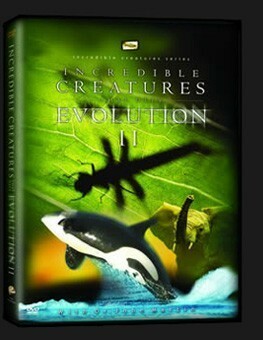 Order the set now (Incredible Creatures That Defy Evolution I, II, III) which includes the companion book "The Evolution of a Creationist"
The book's characters were all inspired from the animals features in Incredible Creatures That Defy Evolution I. 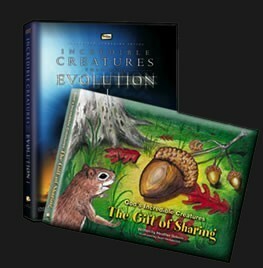 Pack includes Incredible Creatures That Defy Evolution 1 and God's Incredible Creatures - The Gift of Sharing Book. These are not just audio versions of the DVD's but fully produced audio programs on these topics. And you hear things that aren't included in the DVD/VHS programs. 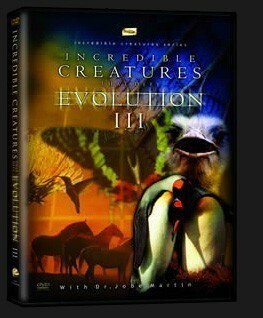 The Incredible Creatures That Defy Evolution audio adventure enters the fascinating world of animals to reveal sophisticated and complex designs that shake the very foundations of evolutionary theory. Host Jim Veldouis sits down with Dr. Martin as he describes these remarkable animals designs in detail. And you'll hear from show host David Hames and his up-close encounter with a Bombardier Beetle and the scars he still carries to prove it! Perfect for use in radio broadcasts, small group settings, classrooms and home school use. Download the Incredible Creatures That Defy Evolution Audio Adventure for FREE by signing up for our email newsletter! Click Here Now. Inspired by the creatures featured in the DVD "Incredible Creatures That Defy Evolution, this board book will delight pre-school children as they learn lessons from nature. Sammy the squirrel has just found the largest acorn ever! and he doesn't want to share it. On his quest to hide the acorn he meets a few of God's incredible creatures. Each one seems to have a special gift and soon Sammy learns that he too has gifts. Travel with Sammy as he discovers the gift of sharing. 3D Board Book with gift. Hear the 30-minute audio special for this feature, online. Incredible Creatures clips are online! Watch actual footage from the feature. "The INCREDIBLE SERIES is technically robust and visually stimulating. It's exciting for all ages. If it was a book you wouldn't be able to put it down.
" This film is exactly what people young and old today need. This is a powerful way to reach the skeptics around you." “Has a solid message regarding the shortcomings of the theory of evolution. I shared this program with my 20-year-old son and 18-year-old daughter, and they were amazed at the intricacy of God's creative power. Should be mandatory viewing in schools throughout America." "I own nearly every video from creationist organizations and these are some of the best!" The Telly Awards was founded in 1980, to showcase and give recognition to outstanding non-network and cable programs. And while David spends most of his time "behind" the camera, he is occassionally called to do some work in front of it, hosting the children's television series, "ZooTV" which took viewers behind the scenes of the Cheyenne Mountain Zoo in Colorado. 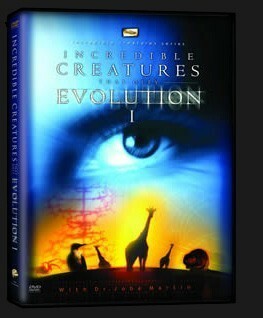 In fact, it was through David's work on "ZooTV" that he was first discovered for "Incredible Creatures." David currently lives in Colorado Springs with his wife Renee and his 2-year-old son, Aidan. And as David will attest, being a Daddy is truly the greatest job he has ever had.